Mr. Lindsay Brucks has been shipping 40-foot containers of life-saving medical equipment for 17 years now. As director of FH Canada’s International Medical Equipment Distribution (IMED) program in Saskatoon, SK, he can routinely be found wheeling refurbished incubators and x-ray machines into giant shipping containers requested by doctors in developing countries. 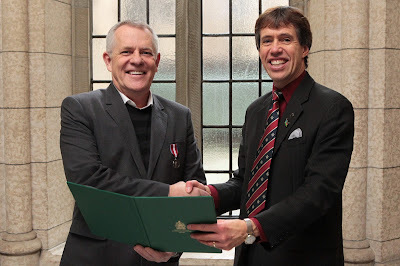 On December 4 he was brought to Parliament Hill in Ottawa, ON to receive the Queen Elizabeth II Diamond Jubilee Medal, which honours significant contributions and achievements by Canadians. Through donations from the Canadian medical system and shipping donations from donors across the country, IMED distributed $2,056,914 worth of specifically requested medical equipment in the last year. Visit www.povertyrevolution.org/medical to join in this life-giving effort and see where medical equipment is being shipped this year.